Stop me if you’ve heard this one before… working parents, busy kids, after school activities, homework and a never ending to do list. If any of this sounds familiar, you’ll completely understand that sometimes it feels like “busy” is an understatement and spending quality time together as a family isn’t as easy as it sounds. With two working parents, three active kids, competitive sports and a whole lot of stuff going on after school and on the weekends, our family is constantly moving. But over the last little while, I’ve come to think of our busy schedules as an opportunity to find new and creative ways to bond on the go. Here are some of the creative ways our family stays connected despite our hectic schedules. Maybe there’s an idea or two in here that can help your busy family too! It’s amazing how small acts of kindness can bring a family together. Whether you’re paying for someone’s coffee in the drive thru, taping a toonie to a vending machine or donating a favourite book to a neighbourhood Little Free Library, your kids (and you) will get excited about making someone’s day. You’ll also have fun planning the next act of kindness. Often reserved for road trips, on-going car games are a fun way to spend time together while running errands and shuffling kids from one activity to the next. As an added bonus, car games also help little kids stay entertained while you’re playing chauffeur. There are lots of car games to choose from, but our family especially likes “Skittles” where we keep count of brightly coloured cars we spot along our drives and the license plate game. So far, my eldest daughter and husband are tied at Skittles and we’ve spotted license plates from every Province, almost every Territory, 49 States and 4 European countries. We keep track of scores and new plates in a notebook that stays in the car. Family meetings seem like a great idea in theory, but making time to come together with a proper agenda can sometimes be a challenge. While there will always be important topics that need to be discussed together at home, especially as the kids get older, for the more lighthearted topics, a walking family meeting (even at the grocery store) can help accomplish a lot. Planning a family trip? Need to come up with a great science project idea? Trying to decide what courses to take next semester? With a little planning and potentially a note taker (who is not responsible for pushing the grocery cart), these family meetings on the fly can be very productive. Take it one step further and have the kids come up with an agenda. I don’t do this as often as I would like, but I know when my kids find a little note in their lunchbox, it really makes their day. Lunchbox notes can be a quick “I love you”, “good luck on your spelling test” or even a knock-knock joke written onto a sticky note and stuck to their sandwich container. A quick search of Pinterest and you’ll have lots of ideas and free downloadable options. On top of making your child smile in the middle of the school day, you’re also helping them work on their reading skills. For older kids and teenagers, lunchbox notes might be a thing of the past. Instead, talk to them in their own language. It’s amazing how quickly teens will engage with you when you send messages using their favourite SnapChat filters or text messages with their favourite emojis. You can also open a family group chat on your phone so kids can easily text parents and siblings all at the same time. Having limited time together does not have to limit the meaningful conversations you have with your kids. The trick is to get the conversation started quickly and move to the important topics right away. Our family’s go-to conversation starter is “Best and Worst”, where everyone in the family shares the best part of their day and the worst. Because “worst” is a very strong word, the kids have learned to really think before saying something was the worst part of their day. Instead, they will gladly say they didn’t have a worst part, which is a great way to develop their positive thinking skills. Other great conversation starters are “20 Questions” and “If, Then, What?”. Because my husband was a police officer when our children were born, shiftwork meant that we didn’t ever get into the habit of sitting down for regular family dinners. We quickly learned that a family meal can be special any time of day and that sitting together over pancakes and bacon is equally bonding as a Sunday night dinner. This year I finally decided to pick up Harry Potter so I could understand what my son was talking about most of the time. It turns out, reading the same books as a family (even on our own time) has become a fantastic opportunity to share similar interests and have great conversations about characters, plots and what everyone thinks will come next. Whatever your version of the perfect family fun day (or night) is, make time in the schedule whenever you can and make it happen. Whether it’s game night, movie outings, hiking or anything else that brings to you closer together as a family – choose a day whenever it’s possible, write it on the calendar, and make it a priority. It doesn’t have to happen every week or even every month, just whenever is right for your family. 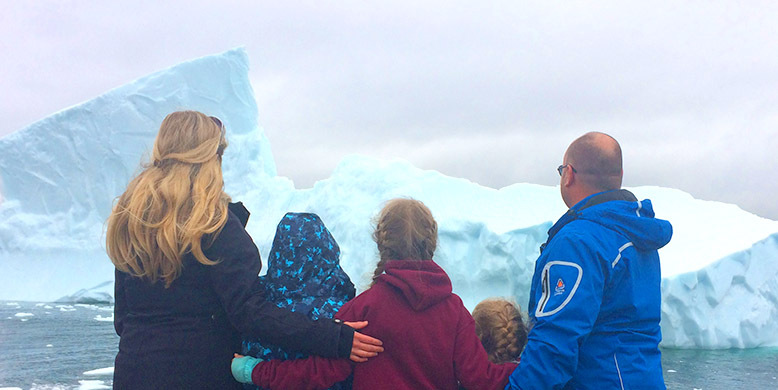 It’s no secret that our family is committed to travelling #CanadaWithKids and visiting every province and territory. We’re well on our way to achieving our goal, but the best part of working towards this goal is the family memories we make along the way. Your goal can be anything that’s meaningful to your family. From donating 100 items of food to your local food bank each year, walking a new trail every month or reading the entire Harry Potter series over the summer. Setting a goal and making plans to achieve it are great ways to connect as a family and can be done little by little in the car, the arena, walking to the school bus and while making dinner. What I’ve learned over my last 13+ years of being a very busy and active family, is that we may be constantly on the go, but that doesn’t mean we aren’t close. Family time comes in different forms and instead of feeling guilty about the time we don’t have together, I am incredibly grateful for each and every moment we spend connecting and making memories.